Are you searching for roofing in San Benito, TX that is cost-effective and dependable? ECO Commercial Roofing can assist you with each of your roofing service requirements, so shoot us a call at (833) 200-0571. We’re experts in a wide selection of roof services, and we take customer satisfaction very seriously. Not only are we dependable San Benito roofers, we’re also participating members of our local communities. Our contractors are extremely knowledgeable on the various kinds of roofing, and we’re glad to assist you with any of your roofing questions or concerns. The professionals at ECO Commercial Roofing are here to help you with all of your roofing needs. When it comes to services for your house or business, a trustworthy contractor is a essential asset. Each of our contractors is trained to industry standards, and we use solely the highest quality of roof materials. We additionally provide a wide range of roof options for you to pick from, as your roof can have a large effect on property value. As far as benefits, make sure to consider the longevity and the performance with the same scrutiny that you choose the aesthetics. Your decision should also fall in line with the kind of roof you’ll be covering, and your set budget for roofing. We have tons of quality options to pick from. Dependable roofing services are our number one objective, and we can provide that in the form of repairs, replacements, and installations too. Whether you need assistance with a commercial project, an industrial one, or a home one, we can assist you! Typically catered towards flat roofs and low slope roofs, our commercial services are the ideal choice for many business owners. Flat roofs need a particular degree of skill in order to ensure the longevity of your system, and enduring resistance to rain, protection from ponding. If you’re interested in industrial roofing, we have the perfect materials and skills for industrial facilities, and we can help you install a roof system that will endure for decades. Finally, we also offer dependable and cost-effective residential roofing services in a wide variety of styles. 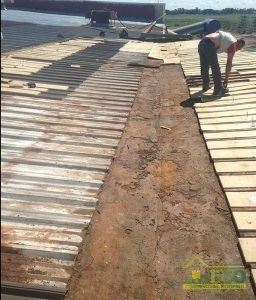 As roofers that specialize in roofing restoration, we understand more than a few techniques to work with roof coatings. We have years of expertise with roof coatings, and we understand that utilizing high quality products such as Conklin can make a major difference when a project is finished. If you need better roofing in San Benito, TX, you can rely on us to provide you with unbeatable craftsmanship, and top quality services. To learn more about our Conklin roof coatings, or to ask questions about our roof restoration techniques, give us a ring at (833) 200-0571! If you’re looking to fix minor damages on your roof, as well as to defend it from further damages, a roof restoration is a fantastic place to start. Correctly done, one of our Conklin roofing restorations can provide an extra 10 years to the life of your roof! If you choose a roof restoration service instead of a roof replacement, you’ll earn savings in your time and money! Commercial Roofing A commercial restoration is less expensive than a total replacement, and generally just as effective. 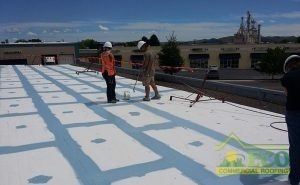 We typically perform our roof restoration with reliable roof coatings from Conklin. These coatings come in a variety of varying materials, and we’re able to help you figure out which one will work ideally for your needs. Some roof coatings apply to surfaces such as rubber more effectively than others, and some deliver better moisture resistance for damp climates, so it is critical to choose the right coating carefully. The majority of roof coatings can also apply directly on top of your existing roof! Call (833) 200-0571 to talk with a roof expert about your roof coating choices. Acrylic Roofing Acrylic roofing is incredibly flexible, and caters well to extreme temperature changes. Elastomeric Roofing Fantastic protection is simple to find with any variety of elastomeric roof coating. As commercial roof contractors, we are capable of servicing a selection of roof types, including the typical flat roof and low-slope roof varieties. Keep in mind that your initial line of defense against punctures or early roof failure is a reliable and expert installation. Our flat roof solutions are designed to outlast the competition, and deliver quality protection for your home. For all of your reliable commercial and residential roofing needs, contact the experts at ECO Commercial Roofing! We don’t only provide our professional roofing in San Benito, TX, but additionally in the nearby areas. An investment in a fortified roof system is an investment in your business that you won’t regret! Dial (833) 200-0571 with any questions, and let us know how we can best help you!